Best Fitbit for Kids: Which One Will You Buy in 2019? →The 5 Best Fitbit for Kids: Which One Will You Buy in 2019? Popish purple and electric blue in color options, the Fitbit Ace is the overall best Fitbit for kids recommended by many parents. Slightly sleek and slim, with a small strap that easily fits kids with smaller wrists, this activity tracker can monitor your kid’s fitness on the go. From counting steps to analyzing sleep, the Ace is feature-rich enough to help monitor your child’s health. The Reminder to Move feature is particularly a great one, because it triggers a response after every 60 minutes of inactivity to remind children that it is time to get up and get on the move. Which Fitbit Should You Buy Your Kid in 2019? Choosing the best fitness tracker for your child can be intimidating. There are many brands, with varying built-in features, selling at different prices. You have to be as picky as possible, but you also want to spend less time choosing an activity tracker for your child. Although there are many fitness tracker brands out there, Fitbit seem to attract more attention than the competition because they design the best Fitbit for kids. From the Alta and the Ace to the Zip and the Charge 2, there is always a good option that you can buy for your young one. The goal of this guide is to help you find a good Fitbit for your young one in the shortest time possible. We have put together four awesome options recommended by many parents. And we tell you why we believe each of these can give you the biggest bangs for the bucks. The following are some of the factors to consider before you spend your money on an activity tracker sold by Fitbit. There are two types of screen displays: touchscreen displays and non-touchscreens. Touchscreen displays offers easier shifting and display options. Non-touchscreen displays, on the other hand, not only ensures no occurrence of mistakes but also better performance. There are also two types of batteries used by fitness trackers: a replaceable and a rechargeable battery. Fitness trackers that come with replaceable batteries may not be the best option for you. Why? Because you will spend extra to replace the battery. It is best to choose a Fitbit with a rechargeable battery instead. Because you can always charge the battery when it runs low and never have to worry about changing the battery – unless you want to. Whether square or circular, thick or slim just make sure you get a Fitbit that your kid is comfortable with. Also make sure that it is made with materials that will not irritate your child. In order to benefit your kid, find a Fitbit that has many health and fitness tracking features, not just a step counter. That way, your kid can get the motivation from the challenges each feature offers. Fitbit Ace is by far the best Fitbit for kids on our list. This premium device not only cares about your kid’s weight loss but recognizes and records their activities as well. Ace lets you keep track of your kid’s workout even without having to push a button. It comes in two colors: popish purple and electric blue. And it is slightly sleek and slim. Because it has a small strap is it not suitable for children with big wrists. Ace has a clean OLED screen with vivid colors; the display shows both your kids’ step counts and health status. In addition, this smartwatch features a clock as a main background display. In case your child stops moving, the ‘Reminder to Move alert’ will ring so that your sons’ or daughters’ performance won’t deteriorate. This alert can also be adjusted so that your kid doesn’t lose focus while in school. Kids can get daily and weekly challenges via the Fitbit App. The smartwatch also rewards them with cool collectable badges and celebratory messages to keep them going. Last but not least, Fitbit Ace has a decent battery life. It can work well for five days on a single charge. If you a tracker with minimal features to help you track your kids’ steps and basic works, then this is simply the tracker to buy for your boy or girl. Today, Fitbit Zip is one of the most popular Fitbit bands for parents who want to help their children set the best fitness goals. This phenomenal activity tracker gives precise results, which means you get accurate stats. Fitbit Zip is so lightweight that it promises to ensure your kids a free and smooth exercising experience. It is not designed for the wrist, so have your kid tuck it on their belt, pants, or t-shirt. Fitbit Zip has a small LCD screen display that displays notifications. This screen is splash, rain, sweat and waterproof, your kid can carry it to the pool or any playground. The Zip is also compatible with the Fitbit App. You can use the app to check your kids’ entire health profile thanks to the Bluetooth technology than sync between your phone and the tracker. When it comes to activity tracking, this tracker can calculate your kids’ steps while running or walking. It can estimate the distance covered and time taken in an exercise. Fitbits Zip doesn’t have a sleep monitoring track. It uses a none-rechargeable coin battery that can last for 4 to 6 months. 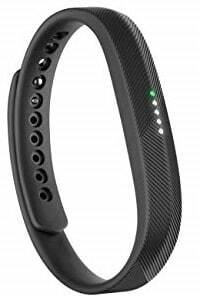 Fitbit Flex 2 is a small, simple bracelet-like device that is water resist and does its job with ease. It comes in different colors and just like a jewelry it can be worn around the neck as a pendant but only after removing the removable screen. Flex 2 has five tiny LEDs, each of them light with a unique color depending on the type of notification received. For example yellow is for calls and purple reminds your kid to keep moving. Additionally, it lights to notify your kid that he or she is close to his or her daily goals. In order for you to get more detailed data, you will have to connect this tracker with the Fitbit App on your phone. This App comes in fully packed with achievements and challenges that makes fitness more fun to your son or daughter. Unlike other trackers, Flex 2 battery is rechargeable and can stay up to 4 days on a single charge. Fitbit Altar HR is 15 mm thick in size, lightweight and comfortable to wear. It is made with a classic design with no button, so it has some kind of a delicate vibe. It is not only capable of recording and observing each of your kids’ movements but also has a heart rate monitor. Alta HR features a screen that allows your kid to view activity information as he or she runs or walks. The wearable is straight to the point as it only displays the required information. No graphics and animations included, so your kid won’t get distracted. The Alta HRs’ strap can be changed so your kid doesn’t have to put up with the basic black colors. Also, it is compatible with Android, iOS and Window devices. Though small in size, HR has a pleasant battery life it can stay up to 1 week. Its recharging cable is slightly short and so recharging might be a bit challenging. Can a child have a Fitbit Account? If your child is under 13 years of age, he or she cannot have a personal Fitbit account. You, the parent, a will have to sync with the Fitbit App installed in your phone. What is the Minimum Age for a Fitbit Account? The Fitbit’s Terms of Service claims that 13 years is the minimum age for a kid to own his or her own Fitbit account. Which is the best Fitbit for kids? We believe that the best Fitbit fitness tracker for kids is the Fitbit Ace because it is designed to help your kid achieve better exercising style by offering animation s and fun activities.